Cancer is awful and childhood cancer seems worse because it takes dreams, longevity, and sometimes even the life itself. Pain feels like a right of passage in adulthood but so out of place in the life of a little one. They should be falling off a bike and scraping a knee, not being stuck with needles, lulled into unconsciousness, and cut open…all to try and save their lives. So often it feels like there is no such thing as a silver lining in this gathering of illness, pain, and bad news. Our choices are usually death or damage and each new week brings crazy hard things. But there’s something amazing and good in the middle of it even on the hardest days. You heard me… I said it. Good – even precious – in the bad. You’re one of them… the ones who look old beyond their years with eyes both kind and weary that say, “I know what it feels like” in a single glance. Cancer Moms — a bond as strong as steel. These are the ones for whom little things can be terrifying and big things are handled without even flinching. Other people’s nightmares are their every day, even “normal” life, and they eat “worst case scenario” for breakfast every morning. And their crazy skills and superhuman strength stems from their hearts – their hearts that are walking around outside their bodies – their tiny bald hearts that live attached to IV poles and chemo. And while the cancer and all that comes with it is sorrow of the greatest and most breathtaking kind, there is a yet a special joy – for there is family and community in this cancer world and it’s crazy because it makes something similar of us all in one way or another. It doesn’t matter where you started, how you live, vote, or devote… we all come to the cancer ward with our shadows, weariness, and the knowledge that everything we do may never be enough. My heart hurts just thinking about it. But does it ever hit you? That you know how to flush a central line like I know how? And you know what it’s like to be up at 2:00 to untangle IV cords or administer a medicine and so do I? …and we’ve never even met! Our hearts connect. Yes, the hearts inside our bodies, as we form friendships of the tightest kind – the kind that at times, need no words. But those pieces of our hearts, our cancer babies, they connect too. Many of them have the same oncology staff family – the doctor who makes your baby laugh might make mine giggle too. And the surgery that wipes him out, weak and weary…well, that same surgery might have been part of your baby’s story too. You can see it in their eyes as they meet each other in the halls of the hospital – there’s a curiosity and sometimes even a hint of awe to see a mirror image and be reminded that they aren’t the only ones – without hair, without immune systems, whose paranoid mom makes them wear a mask, who has learned to walk in step with an IV pole, who throws up – and a hundred over things. There was a time when Chase refused contact with anyone at the hospital, until he saw a little girl and realized that she had a port too. You could see the great dawning on his face that she knew what it would be like to be stuck in the chest and she knew what it would be like to be scared, and they’ve been friends ever since because, you see, the suffering is terrible and wrong, but it’s still a connection point. 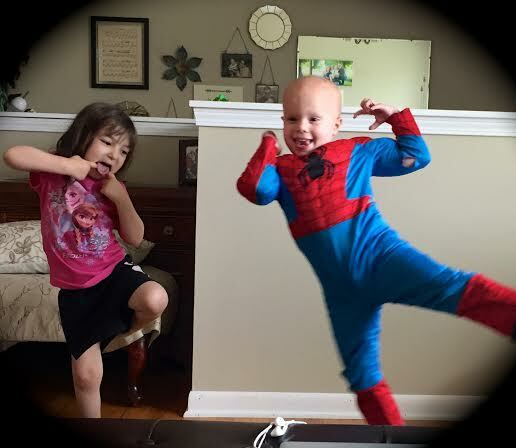 Chase and his friend (in and out of cancer) Mia — you’ll hear more about her next week. And I promise, cross my heart, that I’m not making this up for the sake of a positive outlook in what, for many of us, is one of the hardest months of the year. I can write these things because I’ve lived them and I bet, on some level, you have too. From the parents in an online group, to the parents you met that one time in the halls of the hospital who have since turned out to be your best friends, to watching your babies connect with each other long after chemo goes away – these experiences, this knitting of hearts are so precious. And without these awful-awesome connections, I might just pass you in the grocery store, on a street corner, in the local coffee shop, and we’d just stay in our separate worlds and ways. As I started writing this post, I sat in the outpatient waiting room while my unconscious son was rolled in for yet another MRI, and not too many miles away, one of the cancer mama sisters of my heart (how’s that for an awesome reality show title?) sat in the hospital waiting room while her son lay in his MRI too and there was a text chain of messages amongst the two of us and the other mamas, sometimes dozens of texts, as we all held each other up…as we always hold each other up. And to think that I might have passed one of them one day and never known them, these sisters of my heart, to think that our children may never have known each other and learned to play together – well, that is a tragedy too. I hate the cancer with all my heart, but I wouldn’t trade these precious connections. We are all in the ranks, in the trenches together. 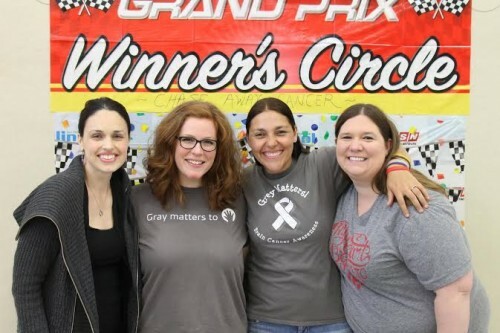 We are cancer families and there is nothing so precious as standing shoulder to shoulder with my cancer mama friends in that sisterhood while the pieces of our hearts run, play, and compare port stories. Never stop choosing joy in your journey, for you are not alone. Ellie Ewoldt is a mother to four, a wife, daughter, sister, and friend. Her skills include being able to keep several plates in the air, while simultaneously warning small children about not throwing plates, labeling the “weird stain” on the rug correctly, and now, thanks to the cancer life, performing emergency triage on a central line in non-sterile conditions. Her days are spent caring for quickly-growing children – one of whom is surviving brain and spine cancer with special neurological needs – and continuing to chronicle life in the big and small things alike. Her first book, Chase Away Cancer will be available in May 2016 through Tyndale House.